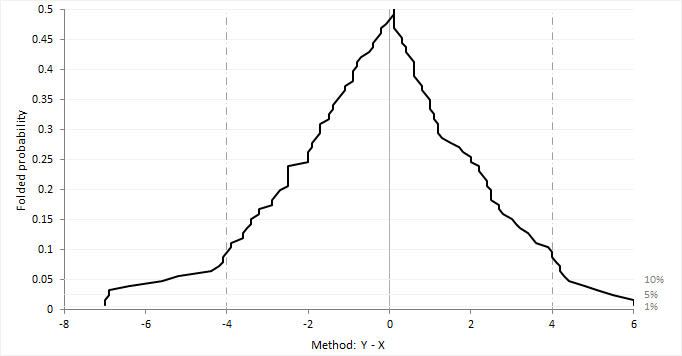 A mountain plot shows the distribution of the differences between two methods. It is a complementary plot to the difference plot. Krouwer and Monti (1995) devised the mountain plot (also known as a folded empirical cumulative distribution plot) as a complementary representation of the difference plot. It shows the distribution of the differences with an emphasis on the center and the tails of the distribution. You can use the plot to estimate the median of the differences, the central 95% interval, the range, and the percentage of observations outside the total allowable error bands. The plot is simply the empirical cumulative distribution function of the differences folded around the median (that is, the plotted function = p where p < 0.5 otherwise 1-p). Unlike the histogram it is unaffected by choice of class intervals, however it should be noted that although the mountain plot looks like a frequency polygon it does not display the density function. It has recently been proven that the area under the plot is equal to the mean absolute deviation from the median (Xue and Titterington, 2010). Krouwer, J. S., & Monti, K. L. (1995). A simple, graphical method to evaluate laboratory assays. European journal of clinical chemistry and clinical biochemistry, 33(8), 525-528. Monti, K. L. (1995). Folded empirical distribution function curves—mountain plots. The American Statistician, 49(4), 342-345. Xue J., Titterington D. M. (2010, unpublished). The p-folded Cumulative Distribution Function and the Mean Absolute Deviation from the p-quantile.